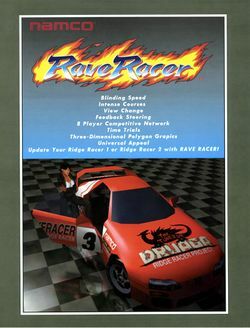 Rave Racer is a racing arcade game, that was released by Namco, in 1995; it runs on the company's System 22 hardware, and is the third title in their Ridge Racer series (along with being the first of only two to not have "Ridge" in its title). As in its immediate predecessor, the players must take controls of one of eight cars, based on their player number (which are again covered in advertisements for older Namco titles) - but this time, there are four different tracks to choose from (that original "Short" Ridge Racer track and its "Long" variant from the first two titles' "Time Trial" modes, along with the two new "City" and "Mountain" tracks) - and there are also twelve new C352-generated songs to choose from. This game also introduces the "View Change Button" which allows the players to change the camera angle from the first-person view of the first two games to a third-person view, with the camera behind their car, when pressed; to change that view back to the first-person, you shall have to press it again. This page was last edited on 17 August 2014, at 16:00.